Rewind to yoga class one month ago. Before we got started, the instructor started off with a story about her recent experience at Starbucks. She ordered her drink (the “pink drink”) and was super friendly to the barista (I forgot the details). In turn, she got her drink for free! Treat others well and you will be treated will in return. Treat your body well and it will treat you well in return, she said. Her golden rule analogy was lost on me because I was entranced by this “pink drink” idea. She mentioned that it had hibiscus tea and coconut milk in it. Inhale, cat, exhale, cow, hibiscus tea, coconut milk. Hmmm. Downward dog, hibiscus tea, right leg up, lunge, coconut milk. I know I’m supposed to focus solely on yoga during class, but I could not stop thinking about the pink drink. 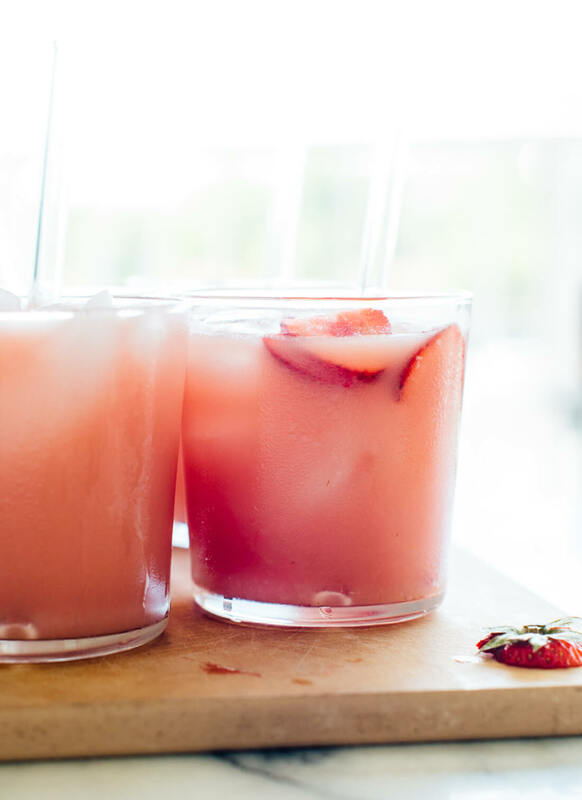 Did you see the hibiscus pink lemonade in the cookbook? I really like hibiscus tea and its naturally bright pink color. So, I went home and started playing around with the idea. I created a pink drink that I really enjoyed before I even drove to Starbucks to try their version. I finally ordered one a couple of weeks later (it’s not on the menu; you have to ask for it). Here’s the kicker, though—I didn’t like it! I liked mine much better, and everyone who has tried it loves it, too. Here’s my pink drink recipe, roughly inspired by Starbucks. The pink drink of my dreams, if you will. It’s light and refreshing, and naturally sweetened with a bit of honey and some orange juice. It’s not nearly as sweet as Starbucks’ pink drink. I think they layer the drink but I just couldn’t manage to get mine to look pretty for long, so we’re mixing it all together in a pitcher for simplicity’s sake. 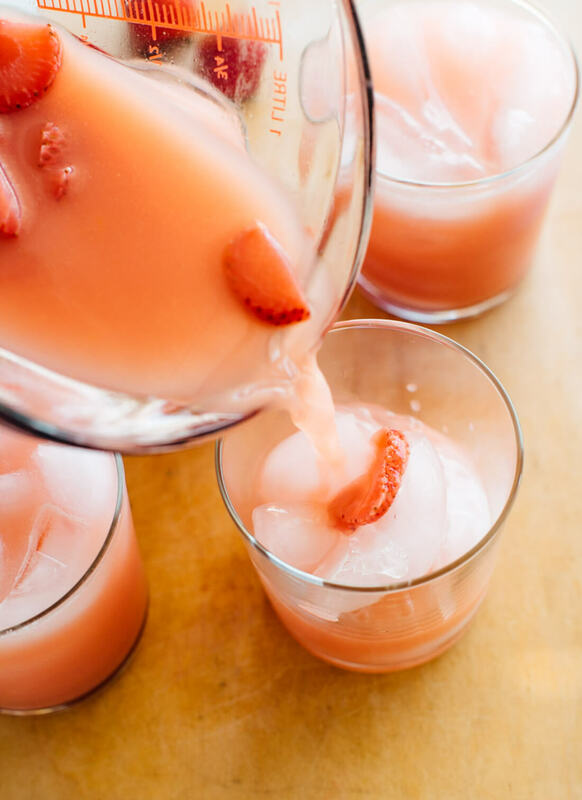 Treat it like a punch recipe, serve it as a mocktail, or sip this pink drink instead of soda. You can add a splash of club soda if you’d like some fizz, but I like it as written below best. Please let me know how you like it! This pink drink is my interpretation of the Starbucks drink. This naturally sweetened hibiscus punch/mocktail recipe is fresh, fruity and super refreshing. Recipe yields 4 cups. Bring the water to a simmer. Place the tea bag in a 1-quart (4 cups) liquid measuring cup or small heat-proof pitcher. 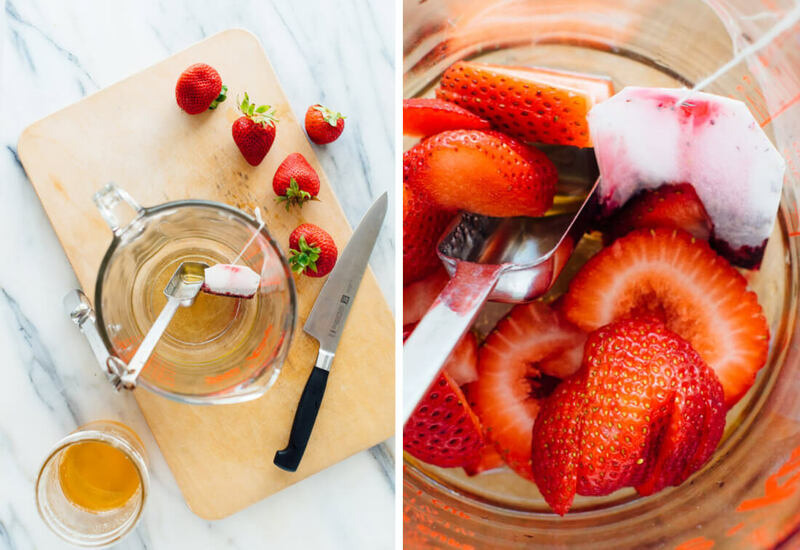 Pour the water over the tea bag, stir in the honey until dissolved, and drop in half of the sliced strawberries. Let the mixture steep for 10 to 20 minutes. Discard the tea bag. Pour the orange juice and coconut milk into the mixture and stir to combine. Fill drinking glasses with ice and divide the pink drink between the glasses. 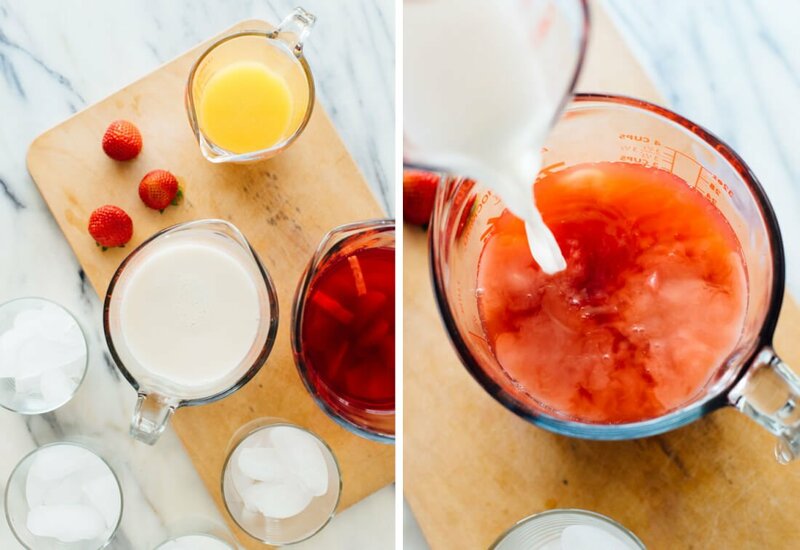 Garnish the drinks with the remaining sliced strawberries. Serve immediately. Make it vegan: Use maple syrup or your vegan sweetener of choice instead of the honey. 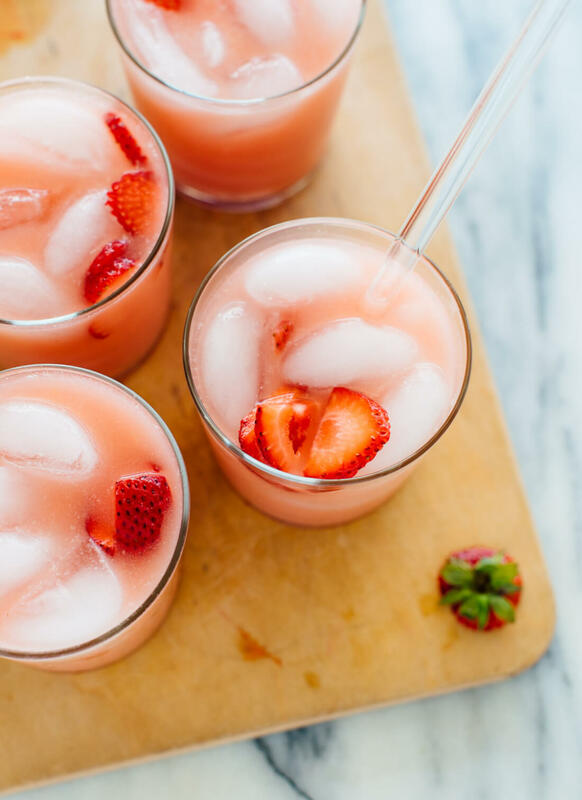 This looks delicious, and so refreshing! Sadly I have neither hibiscus tea nor coconut milk in my house at the moment, but I’ll have to add those to the grocery list. 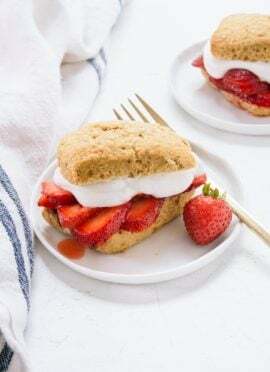 Maybe make some for the 4th of July? Ooh, great party drink idea. whoa whoa whoa. Hibiscus and coconut milk?? This sounds perfectly heavenly. I would have been distracted during downward dog as well! I’m totally making this to take with me to work today. I think it’s actually on the “secret” menu! Regardless, this one is better (sorry S-bucks). I think you’ll love it! This looks and sounds delicious and refreshing. Can’t wait to try it! Let me know how it goes, Paula! It sounds yummy! I have loose hibiscus tea. How much would you recommend to use for this recipe? Hi Lynn, so sorry for the slow response. One tea bag is about 1 teaspoon loose tea. Hope you enjoy this one! Thanks, Dhyan! I love hearing from you. Thanks for reading! Sounds lovely! What if you wanted to add a light touch of tipsiness for a summer cocktail party? What would that be? I’m thinking maybe rum? I think rum would be amazing in this, Fern. Probably a white rum? Haha, that description of your thoughts during yoga really made me laugh! I’m often thinking about dinner while in yoga class. Ha! Right? I can never get my mind to totally settle down. This looks amazing! I can’t wait to try this! Also, thank you for sharing all of your blogging tips, I’ve definitely been reading up! Which kind of coconut milk do you prefer? I think the stuff from the can is generally tastier but more caloric and fatty, while the stuff in the carton is less caloric and fatty but not as tasty. I just wonder which kind you typically use. Thanks! 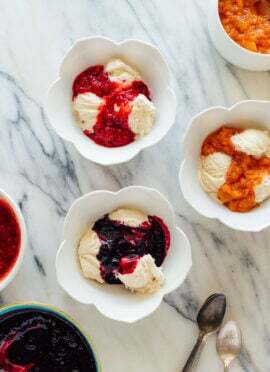 I used Trader Joe’s light canned coconut milk for this one– it should be super creamy. When I saw your title, pink drink, I was reminded of my childhood days when we referred to the flavor of our drink by it’s color! Purple was always my fav, but I’ll have to try your pink drink to compare! Let me know how it goes, Alison! I always find Starbucks drinks are super sweet. I’m pretty sure this will be on high rotation here, I mean it’s pink! Yes, same! I think this one has the perfect amount of sweetness. I haven’t had (or heard of!) pink drink before, but I bet I’d enjoy this more than anything they make at Starbucks. I hope you try this version, Allyson! Let me know if you do. Sounds yummy. Will give it a try for a mid morning pick me up. I make so many of your salads. Thank you for, as my husband says to me,” being right up my alley” . Spiced rum is definitely a contender for the boozy version of pink drink. I hope you try it, Lori! How many calories are in this total? Hi, Jada! Unfortunately, I don’t have nutritional info available for my recipes just yet. I’m looking for a solution, and will update about it once I find one. In the meantime, here’s a nutrition calculator that might come in handy. If I’m honest, the idea of combining orange juice and coconut milk seems super weird, but you’re recipes have never failed me yet so I’ll put my preconceptions aside and give it a try. I *promise* it turns out great. This drink looks amazing! (And your blog is awesome.) These glasses caught my eye. Do you remember where you purchased them?? Hey Kate! Those are inexpensive glasses from West Elm. I can’t find them on their site anymore but I think Williams-Sonoma sells the exact same kind. Here’s a link! They’re the short tumblers. Oh I have to make this!!! 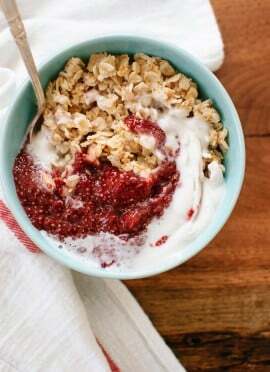 I love the idea of adding coconut milk!!! I made it! I am on my 3rd round, because even with the recipe as a guide I found I was still trying to get it right. Based off practice rounds, I waited until the tea had cooled before adding milk. Even then it should be consumed immediately, as the drink turned less pink overnight and separated. I used slightly different ingredients – coconut water (bc I had it), and almond milk (bc in fridge). It’s still delicious and I keep making it! Yes, this one is definitely better right after it’s made. Thanks so much for the notes, Kristy! I’ve been thinking about this drink since I read the post and I am making it as I type! Thanks, Kate! You’re welcome, Emily! I hope you enjoy it. I just made it, and it is divine! Thanks for all the fabulous recipes! Thanks for sharing, Caren! I’m glad you loved it. So this started out healthy with the honey and all but wasn’t sweet enough (I made a whole picture of it). So anyways, I ended up adding white sugar to it and white Haitian rum – lots of rum! This was amazing! It’s freezing cold outside now but hubby loved it and we imagined taking big coolers of this to the beach next year. Thanks for the recipe! I’m sorry you didn’t think it was sweet enough! But, I’m glad you liked it with your alterations, Val.